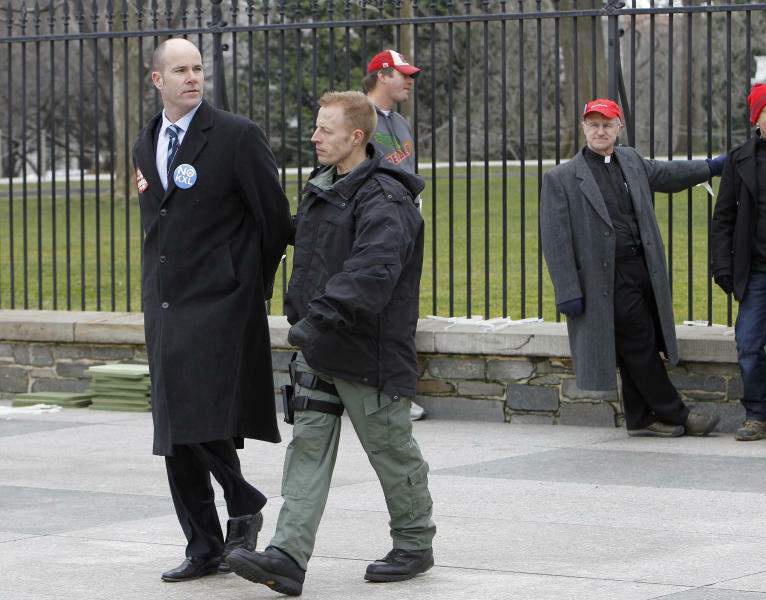 WASHINGTON (AP) — Prominent environmental leaders, including the head of the Sierra Club, were arrested Wednesday after tying themselves to the White House gate to protest the Keystone XL oil pipeline. Executive director Michael Brune is the first Sierra Club leader in the group's 120-year history to be arrested in an act of civil disobedience. The club's board of directors approved the action as a sign of their opposition to the $7 billion pipeline, which would carry oil derived from tar sands in western Canada to refineries along the Texas Gulf Coast. Activist Bill McKibben, actress Daryl Hannah, civil rights leader Julian Bond and environmental lawyer Robert F. Kennedy Jr. also were arrested Wednesday, along with several dozen other activists. The protesters are demanding that President Barack Obama reject the pipeline, which they say would carry "dirty oil" that contributes to global warming. They also worry about a spill. Many business and labor groups support the 1,700-mile pipeline as a source of jobs and a step toward North American energy independence. The 4-year-old project has become a flashpoint in the debate over climate change, with opponents labeling it a "carbon bomb" that could trigger global warming. Supporters call that rhetoric overblown and say Obama should approve the pipeline as part of his "all of the above" energy policy, which encourages a wide range of domestic energy development. In an interview before his arrest, Brune said it was important that he engage in civil disobedience to show the depth of opposition to the pipeline among Sierra Club members. The club is the oldest and largest environmental group in the United States. "We want to send a strong message that we expect the president's ambitions to meet the scale of the challenge and reject a pipeline that carries dirty, thick oil" that contributes to global warming, Brune said. The president's supporters want Obama to "fight with both fists" against climate change, Brune said. Obama has called climate change a serious threat and urged Congress to combat the phenomenon in his State of the Union speech Tuesday night. If Congress fails to act, he will use executive authority to take steps to cut greenhouse gas pollution and encourage increased use of cleaner sources of energy, Obama said. Obama has twice thwarted the Keystone XL pipeline because of concerns over its route through sensitive land in Nebraska, but has not indicated how he will decide on the pipeline now that Nebraska's governor has approved a new route. The State Department has authority over the project, because it crosses an international border, but most observers expect Obama to make the final decision. Wednesday's protest came hours before the American Petroleum Institute, the largest lobbying group for the oil industry, again urged Obama to approve the project. 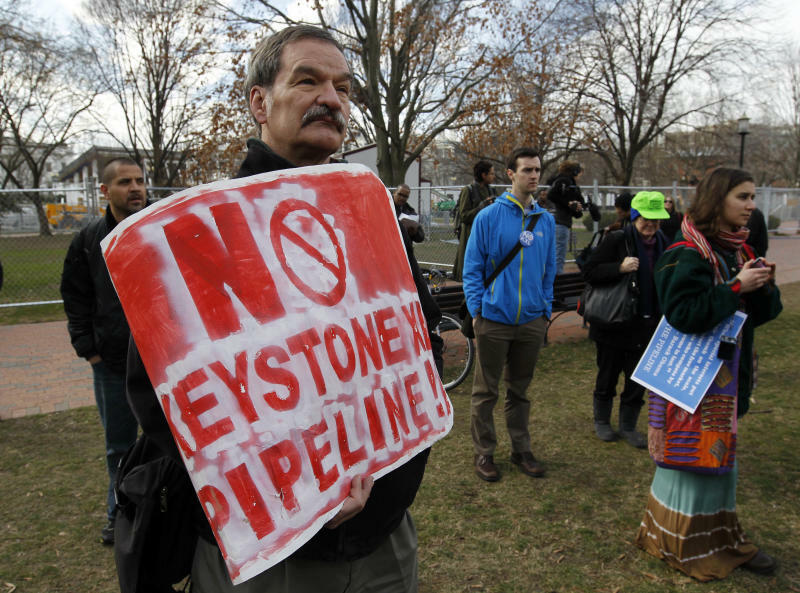 The group said it will pay for ads supporting the pipeline and will mobilize grassroots events across the country urging Obama's approval.